I’m one of Steve’s High Tension Wires group members. I have had lessons with Steve for the last few years and not only am I very pleased with my progress, but as Steve says we have become not only a group of musicians but a group of like-minded friends. Unfortunately all guitarists suffer from a syndrome known affectionately as GAS, or Guitar Acquisition Syndrome and I am not immune. 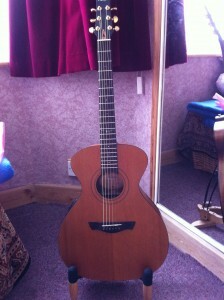 My latest guitar is a Vintage VE2000GG Gordon Giltrap signature 6 string acoustic/electric. I will post a picture of it as soon as I can work out how to do that, but that means I will have to take some time out from playing it – it is very difficult to put down! Several of Steve’s mature students, including myself, are currently studying for the Acoustic Guitar RGT grade examinations, and in addition to Steve’s lessons we get together to work on and practise the requirements of the exams. Once I get accustomed to adding pictures I will put some more pictures of my other instruments and equipment! Well I have managed to upload a picture of my new baby which had it’s first outing with the group on Wednesday 15th June at the Blackheath Rugby Club. It is a very narrow waisted guitar, designed by Rob Armstrong to Gordon Giltrap’s exacting requirements, and it has taken the Guitar press by storm as being avery high quality instrument – an extremely close copy of the handbuilt models – at a very reasonable price. It is comfortable to play, but the narrow waisted shape is not to everyone’s taste. Thanks to Merchant City Music in Glasgow for supplying it for me.